I read an article yesterday saying that she is now the world's most desirable batchelorette and that she is now being targeted by dukes, princes and the Chelsea back four. To be fair, the pic you posted is a bit unflattering. Still, I do agree that she looks older, maybe not by decades, but by at least a few years yes. I'm not very surprised. That paper is jokes! She's attractive, then came into the public eye for an incredibly big event, so now everyone's like "OMGZOR SHE'S LIKE THE BEST THING"
What? You've never had a bad picture of yourself? Are you just that attractive? I couldn't believe she was 27! People r making a fuss of her and yes she is pretty, but I totally thought she was Kate's older sister. And the dress she wore was too plain and too bride like 2! She should marry Harry. I'd agree, she looked just as nice as Kate. She is fugly. She looks way older than her age. Kate is hot. Kate looks a little bit older than her age. 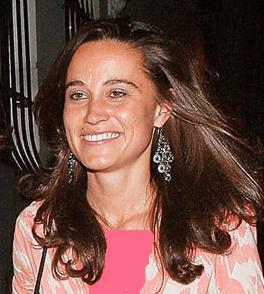 I don't know why people are saying Pippa is hot? :s She's definitely the ugly sister. What is the fascination with her arse? You couldn't even see the outline of it. Granted it is the Daily Mail but still she should not be getting anywhere near this amount of press coverage. Why don't you choose the most unflattering picture you could find!!! she looks younger and hotter. Uhhhhhhhhh uhhhhhh ohhhhh, mmmmmmm. Damn.